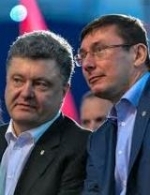 Ukrainian Prosecutor General Yuriy Lutsenko has submitted a letter of resignation to President Petro Poroshenko, Prosecutor General's Office spokesperson Andriy Lysenko has told Ukrinform. "Today Prosecutor General Yuriy Lutsenko has submitted to a letter of resignation to the president," he said. According to Lysenko, now "the president has the last word." On November 6, Prosecutor General Yuriy Lutsenko said from the rostrum of parliament in response to the calls of activists that he would write a letter of resignation. He appealed to people's deputies to consider his resignation statement this week. Subsequently, during a vote called by Verkhovna Rada Chairman Andriy Parubiy, the parliament did not support the resignation of the prosecutor general, as only 38 deputies voted for this offer.